New York’s Best Architecture Block? I was loitering around Lafayette St. in the Cooper Square area when it occurred to me that Lafayette St. between E. 4th and Astor Pl. has a lot of nice-looking buildings. Many are landmarked, most dating to the 1880-1900 period, and one goes all the way back to 1831. Is there a better single block in Manhattan? Tough competition, I realize, and it depends on what your tastes are. Lafayette St., named for the French general, is a relatively new addition to the Manhattan map. It was created in the early 1900s by extending it south from the formerly exclusive Lafayette Pl. (running for one block south of Astor Pl.) and combining it with the roadbeds of the former Marion and Elm Sts. A cutoff section of Elm St. north of City Hall is today’s Elk St.
DeVinne Press Building, 393-399 on the NE corner of E. 4th. When researching the building, from my Photo-Lettering type days in the 1980s, I remembered the Bodoni-esque DeVinne type font. Thomas DeVinne was a giant of print on either side of 1900, publishing then-popular but now forgotten magazines such as Scribner’s, Century, and St. Nicholas Children’s Magazine (I lapped up the latter as a kid, after I found back issues at the library). The DeVinne name was famed for innovative type fonts and high-quality books and magazines. As the National Register of Historic Places plaque says, the DeVinne Press Building boasts tremendously thick load-bearing walls as the building was completed in 1885, before the era of steel skeletons. Note the five different types of arched windows. The landmarked Colonnade Row (LaGrange Terrace), on today’s Lafayette St., was built from 1831-1833 (on the much shorter and exclusive Lafayette Pl.) by architect Seth Geer, and originally consisted of nine houses, only four of which remain today. When first built, the houses were occupied by social bright lights of the era such as the Astors and Vanderbilts. Famed authors Washington Irving, Charles Dickens, William Makepeace Thackeray all stayed here and President John Tyler got married here on the sly. Since its plummy days, Colonnade Row has been allowed to chip, molt and deteriorate into a fabulous ruin. Blue Man Group took over a basement space in 1991 and has gradually become a worldwide phenomenon. The whereabouts of the five missing Colonnade Row buildings had been a mystery, after John Wanamaker, the Philly department store king (see below), bought them and had them removed in the first decade of the 20th Century. It was thought the missing columns and facades were lost forever. It turns out that they’ve been on the grounds of the Delbarton School, run by St. Mary’s Abbey in Morristown, NJ, for many years. 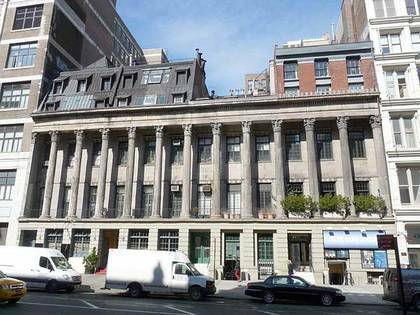 It’s a tossup about the most distinctive building on old Lafayette Pl., between Colonnade Row and the Joseph Papp Public Theater, which face off across the old drag. Since the Colonnade hasn’t been taken care of over the years to the degree it should’ve been, and several units have been carted away, I suppose the Papp should take the prize. The building was built as the Astor Library and it forms such a cohesive unit today you wouldn’t think it was completed in stages (1853, 1859, 1881) by three different architects. The Astor Library combined with two other libraries to form the NYPL and this was its flagship building before the literary lions, Patience and Fortitude, took their place at the “new” building on 5th and 42nd in 1912, in a building that replaced the Receiving Reservoir of the Croton Aqueduct. In 1967, stage impresario Joe Papp (1921-1991) got the City Council to authorize the purchase of the building in 1967 as the new permanent home of the NY Shakespeare Festival, now the Public Theater. Both the inside and outside of the building were then meticulously rehabilitated. 436-440 seems relatively modern but it’s older than it looks; it was on Lafayette Pl. by 1870 and was constructed for men’s clothier Alfred Benjamin & Co. There are interesting touches like six escutcheons (shields) each featuring two eagles and a ram’s head. Gerard Wolfe, in New York: 15 Walking Tours, thinks the haberdasher’s initials can be made out on them, but I don’t see it. There’s also a grand old brass clock left over from Mann Refrigeration’s tenancy in the building. Fronting the narrow plot on Lafayette between Astor Pl. 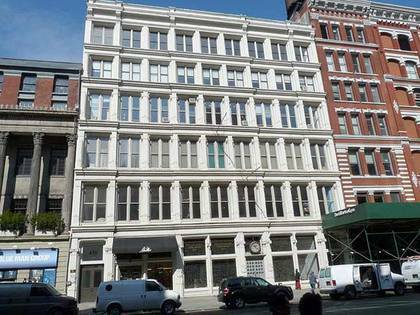 and E. 8th is the Astor Place Hotel, formerly known as the District 65 union hall, and before that, Clinton Hall and before that, the Mercantile Library, completed in 1892. 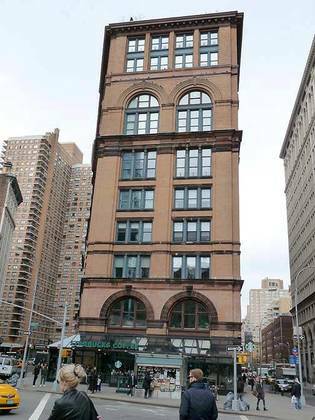 This Romanesque Revival building was designed by George E. Harney and constructed by the McCabe Brothers in 1890-92 for the Clinton Hall Association, which installed its Mercantile Library on the sixth and seventh floors. Clerks of downtown merchants founded the library in 1820 as a reading and research space. 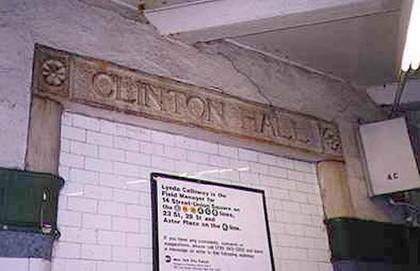 Old Clinton Hall is also one of two stations to have an extant direct entrance from a subway platform underneath it. A long bricked-up entrance can be found near the turnstile on the downtown Astor Pl. platform. (The other such door is on the Times Square Shuttle platform and went to the Knickerbocker Hotel.) The stations were built in the days when you were sold a ticket and gave it to a person who’d take it and put it in a ticket chopper. 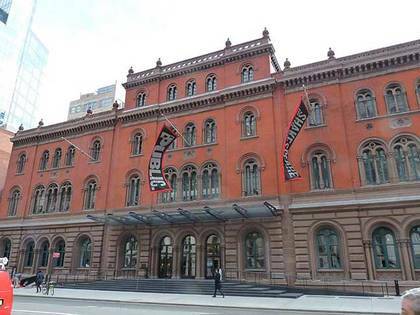 The building stands on the site of the Astor Place Opera House, where, in 1849, Nativist theatergoers rioted against the appearance of British actor William Macready. Twenty-two “patrons” were killed. 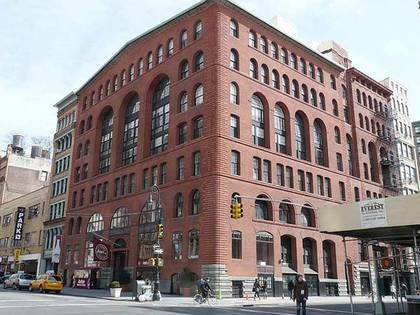 The classic Cooper Union building still anchors Cooper Sq. as it has since 1859. Inventor Peter Cooper, who laid the first transatlantic cable, ran the first successful railroad, and was the first producer of edible gelatin, founded the school. (Cooper was the father of Jell-O.). The school’s great hall was where Abraham Lincoln launched his presidential campaign in 1860; other speakers have included Mark Twain, Frederick Douglass, Susan B. Anthony and presidents Grant, Cleveland, Taft, Theodore Roosevelt, Wilson, Clinton and Obama. The college is divided into three schools: the Irwin S. Chanin School of Architecture, the School of Art, and the Albert Nerken School of Engineering. It offers undergraduate and Master’s degree programs exclusively in the fields of architecture, fine arts, and engineering. 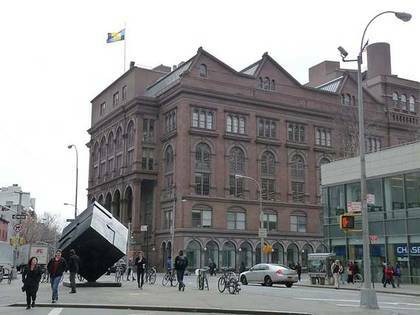 Tony Rosenthal’s nearly one-ton cubist sculpture called Alamo, installed in Cooper Sq. in 1967, can rotate if you push it hard enough, or get enough people to help you. The former John Wanamaker Department Store Annex is one of the few NYC buildings that take up an entire square block (even Macy’s doesn’t). The main store was a block to the north and was demolished decades ago. It was Wanamaker who tore down five units of Colonnade Row to make way for a truck warehouse, which still has his name on it. 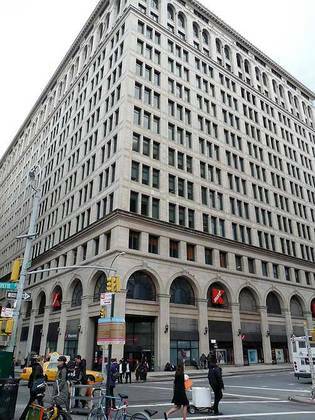 The Astor Place subway station still contains an entrance to the store—now a K-Mart (formerly Kresge’s) on the ground floor.